frets that progresses into the back..
today, this book will impress you. the forehead and excellent paint throughout. 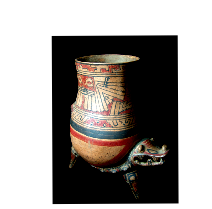 An attractive and large ceramic incensario from Ecuador. Broad shouldered naked male seated in a frontal pose on a stool with a stepped base. Facial features are incredibly bold and realistic. Wears traditional large disc ear plugs. A very large shallow platter type headdress. 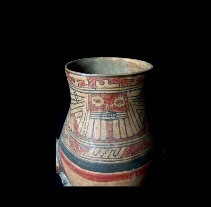 Excellent tattoo motifs on upper chest and back indicates the high rank of this individual. Highly burnished marbleized brown-black ceramic contributes to its beauty. An attractive set of ancient tools for weavers. 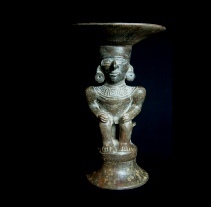 Large robust Spindle and Whorls from the Quimbaya region of Columbia. Sizes range from 10.5”/26.67 cm to 12”/30.48 cm. 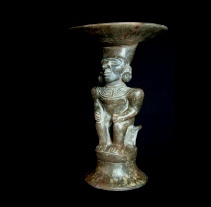 This piece is one of two being offered from a prized collection published in Cobre del Antiguo Peru - The Copper of Ancient Peru. Highly sought by specialist and collectors. p. 384; plate 70. 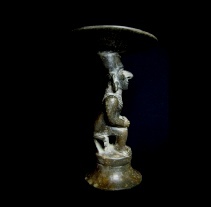 A fine Tiwanaku sandstone idol. 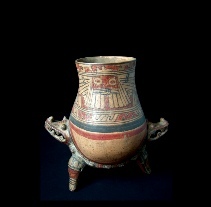 Body is stout with deeply incised quadratic face and body features. Hands are held at center and high. Wears a full ceremonial garb with banded headdress.